Published: May 19, 2008 at 06:49 p.m. Updated: July 26, 2012 at 08:21 p.m. While minicamps and OTAs are underway around the league, some consider May and June to be the slow months of the NFL calendar. With that in mind, it's the perfect time to learn more about the game. So let's look at this as an opportunity to go to school in order to be a better fan. You ask the questions and I will attempt to answer them to the best of my ability and hopefully give you a richer understanding of how the NFL works and the game is played. There are no questions too simple to ask, no idea too hard to comprehend. If it's on your mind, it's on the mind of a lot of fans. My first set of questions comes from Dave of North Carolina. He wants to know about the business of the game. 1. What is the difference between waived, cut and released? All three terms are synonyms for termination of employment. The number of years of service in the NFL and the time of year has a lot to do with each term as it relates to individual players. A vested veteran player with four years of service will be handled differently from a player with less years of service. Keep in mind football does not have recallable waivers like the business model baseball works under. Duane Starks is free to sign with any club after being released by the Raiders last week. Waived: A non-vested player (less than four years of service) who is terminated goes through waivers. When he is released another team can claim him within a certain period of time. A vested veteran only goes through the waiver system from the trading deadline in midseason through the end of the season. During the offseason and all the way up to the trading deadline, a vested veteran gets released. Released: A vested veteran is free when he is terminated and can sign with any club. Keep in mind, if the termination takes place between the end of the trading deadline and the end of the calendar year, the player goes through waivers. A vested veteran released this time of year is free to sign with any team. For example, Duane Starks was terminated last week and he was not subjected to the waiver system. Cut: Is an unofficial term for being terminated and one of the above two categories applies. 2. Do players receive the same salary when they are on injured reserve as they would if they were active? Players who are sent to injured reserve by a club receive their full salary unless they signed a "split contract". A split contract designates a base salary for a player if he makes the team and a lower salary if he winds up on injured reserve. Typically the only players signing a split contract are undrafted rookies and a few veterans with severe medical histories. 3. How does a team handle the salary cap issue when a player dies, as in the case of Sean Taylor of the Redskins? From a salary cap management view when a player dies he is treated like a player released or traded. His salary is stopped and all forms of bonus that were paid to the player but not yet charged to the salary cap are brought forward as a cap charge. In the case of Taylor, signing bonus charges were brought forward into the 2008 salary cap book for the Redskins. A few years ago, the Raiders signed a draft pick with a significant signing bonus and the player died a few days later from an epileptic seizure. The Raiders paid off the remaining bonus the following year. 4. How are players paid during the season, in the offseason, during workouts, the OTA's and training camp? Most players receive their entire salary during the season. The salary is referred to as Paragraph 5 and in most situations you take the salary and divide it by 17 weeks to determine the weekly salary. Example, if a player is scheduled to make $1.7 million then his weekly salary is $100,000. A player who gets a four-week suspension loses $400,000. During training camp, all veteran players receive a "per diem" payment of $1,225 a week and rookies receive $800 a week. 5. Please explain all of the insurance issues surrounding players. Who pays for non-football injures such as when Ben Roethlisberger had his motorcycle injury? Are free agents insured? What is injury protection which I have been hearing about since Kevin Everett was released? What about life insurance? As it relates to non-football injuries, such as Roethlisberger's motorcycle accident, the player is covered by his health insurance through the NFL Players Association. The annual player deductible is $400 or $800 for a family plan. A free agent with four or more years of service (vested veteran) who is released or is a free agent trying to sign with a team will receive full medical benefits for five years. If a player with less than four years of service is out of work, he's on his own to get medical insurance. Injury protection is designed for players physically unable to perform because of a severe football injury in an NFL game or practice, unable to participate in the last game of the season and undergo reasonable rehabilitation treatment as required by the club during the offseason following the injury. If the player fails the subsequent preseason physical and the club terminates him, he qualifies for injury protection. The player qualifies for 50 percent of his next year salary up to $275,000. In 2009, it goes up to $300,000. Rookies are entitled to life insurance and it increases $30,000 for each year of service in the league up to a maximum of $300,000. Jack from Florida has a number of questions about offensive formations. 1. What do analysts mean when they talk about "Y open"? The letter "Y" is a designation for the tight end. The split end on the line of scrimmage away from the tight end is the "X" receiver, while the wide receiver off the line of scrimmage -- usually on the tight end side -- is known as the "Z". The first back releasing or lining up to the "X" side is the "A" back and the first back releasing or lining up to the tight end side is the "B" back. Antonio Gates presents several matchup problems for opposing defenses. The term, "Y open", refers to the tight end not lining up next to a tackle in a traditional formation. 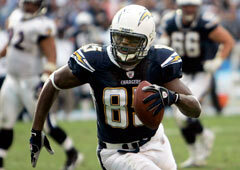 Any team with an athletic tight end like Antonio Gates, Tony Gonzalez or Todd Heap uses the set. When the tight end is opened up the first thing a quarterback will do is check for the matchup. Most linebackers can't cover a good athletic tight end in this alignment. Some safeties will struggle to stay with a tight end and a team like Denver might even put a corner on a man like Gonzalez. Every team is looking for a "Y open" player if they don't already have one. When a team like Cleveland selects Martin Rucker when Kellen Winslow is already on the roster it means the package is expanding. Study the teams with legitimate "Y open" packages and you will notice they are usually excellent running teams. San Diego, Philadelphia, Dallas, Kansas City, New York Giants and New England are just a few teams that force defenses to put at least a defender and a half on their "Y open" and that opens up the running game. 2. What is an "empty set" and what do the announcers mean when they say "three by two"? An "empty set" is when the quarterback is the only player in the backfield. The other five skilled players (excluding the linemen) are all outside the offensive tackles. When someone references a "three by two" set they are describing an empty formation where there are three eligible receivers on one side of the field and two eligible receivers on the opposite side. An "empty set" deep in the red zone has a quarterback draw alert attached to it and the middle linebacker has to be aware that an athletic QB has enough blockers to get a man on all four down linemen and the middle linebacker. 3. What is a "bunch set" and what problems does it cause? A "bunch set" is an offensive formation where three eligible receivers line up close to each other on one side of the field, usually just a few yards from the offensive tackle. Typically, it includes a tight end, a wide receiver and either an extra wide receiver, second tight end or a running back. The concept is that on the snap of the ball, the players can cross each other and hope to free one of the three receivers from coverage. Most teams defending a "bunch set" use zone coverage to prevent a defender from being picked by a teammate in man coverage. The formation is an excellent weapon for young quarterbacks who struggle to read coverage. An inexperienced QB knows he's getting zone coverage and he can wait on the open man to come available. Defenses know one of the three options has to be on the line of scrimmage and they attempt to jam his release and when it becomes a two-receiver release it is a lot easier to cover the routes. Have a football-related question for Pat that you would like answered in a future column? Email him at footballmentor@aol.com. "Movin' the Chains," Pat's SIRIUS NFL Radio show with co-host Tim Ryan, can be heard weekdays from 3-7 p.m. ET.